Bunni Love is the SERVPRO of Lake Conroe, Magnolia & Cleveland's office mascot and the loved pet of Karen and Bruce Peterson. She has been with the SERVPRO family since 2012 and loves coming to the office to visit! Julie is our lead office administrator and has extensive experience managing the office and insurance claims. Julie is IICRC certified in Water and Fire Restoration as well as QuickBooks and Xactimate. She has led the office staff through many storm situations and is the go to person in the office. Julie is extremely knowledgeable, highly competent and works above and beyond her normal duties. Her attention to detail and work ethic does not go unnoticed. Having her with us has been a blessing! When you call SERVPRO of Lake Conroe, Magnolia & Cleveland chances are Brandie will be answering your call with a friendly voice, ready to help! She is our Customer Care Coordinator responsible for dispatching all incoming jobs and responding to customer concerns. Brandie is with our customers from beginning to end to ensure our customers’ satisfaction all along the way. We love having Brandie as part of our SERVPRO of Lake Conroe team! 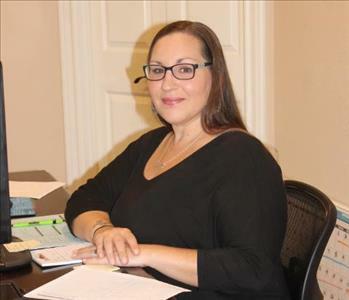 Gina is part of our office administration team and holds the title of Job File Coordinator. Gina communicates daily with customers and works closely with our insurance representatives. Her daily activities include coordinating all of the files in the office, creating estimates and ensuring our jobs are ready for invoicing and audit. We are happy to have Gina as part of our SERVPRO of Lake Conroe team! Breny is one of SERVPRO of Lake Conroe’s more experienced Production Technicians. Breny is known for his customer service and communication skills. He has completed our rigorous SERVPRO Employee Certification Training Program and is IICRC certified in Water and Fire Restoration. This program teaches advanced cleaning and restoration techniques and how to properly use our state-of-the-art equipment. There isn’t a day Breny doesn’t have a smile on his face. Thanks for being part of our team and ensuring our customers get the best service possible! Anthony is one of SERVPRO of Lake Conroe’s more experienced Production Technicians. He uses his extensive knowledge to help our customers when disaster strikes. He has completed our rigorous SERVPRO Employee Certification Training Program. This program teaches advanced cleaning and restoration techniques and how to properly use our state-of-the-art equipment. Anthony is also IICRC Certified in Water and Fire Restoration. We enjoy having Anthony as part of the SERVPRO of Lake Conroe team! Robert is a member of the Production Team and is ready to help out at with any type of job at SERVPRO of Lake Conroe. Having completed the rigorous SERVPRO Employee Certification Training Program, he is ready to help whether it is a Tuesday afternoon or the middle of the night on a Saturday! Robert is also IICRC Certified in Water and Fire Restoration. He is very well rounded in all aspects and can handle any type of job here at SERVPRO of Lake Conroe. Thank you for being part of our SERVPRO of Lake Conroe team! Brian is one of the newest team members at SERVPRO of Lake Conroe and he is currently undergoing our rigorous SERVPRO Employee Certification Training Program. By his dedication and commitment to SERVPRO of Lake Conroe, Brian has proven his ability to successfully grow as a production technician. He will also be obtaining his IICRC certification in Water and Fire Damage within the coming months. We are happy to have you with us, Brian! Mark is the newest team member to the SERVPRO of Lake Conroe family and he is currently undergoing our rigorous SERVPRO Employee Certification Training Program, along with Brian. We are positive Mark’s attitude and perseverance will make a great addition to our Team. Welcome aboard, Mark! Benito is our Warehouse Coordinator. He helps us maintain our warehouse by ensuring our equipment, materials and supplies are put back in their designated areas. Benito has a strong worth ethic and his positive attitude is contagious! We are very happy to have Benito as part of our SERVPRO of Lake Conroe team! Kimberly is our Marketing Support Coordinator and has been with SERVPRO of Lake Conroe since 2013. She is IICRC certified in Water and Fire Restoration and manages all of the Social Media and ongoing Website Information for our franchise.